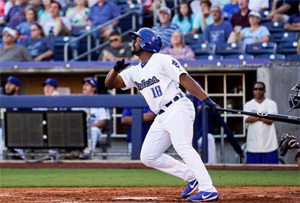 Entering this season, outfielder Quincy Latimore had hit 81 home runs at the Double-A level during his minor league career, but the 28-year-old had been held without a homer in his first 26 games with the Drillers. That drought ended Wednesday night at ONEOK Field in the first game of a three-game series with Frisco. Latimore broke a sixth-inning tie with a three-run shot that propelled Tulsa to an eventual 12-3 victory. The win improved the Drillers second-half record to 8-5 and kept them in first-place in the Texas League’s North Division standings. The two teams traded runs in the early innings of Wednesday’s opener with Tulsa striking first. Leadoff batter Tim Locastro opened the bottom of the first with a double and scored the game’s first run on a two-out base hit by Matt Beaty. The RoughRiders answered in the top of the second. Eric Aguilera drew a leadoff walk from Walker Buehler and scored to tie the game on a ground out by Luis Marte. The back-and-forth continued as the Drillers retook the lead in the bottom half of the second. Wynston Sawyer doubled with one out, moved to third on a base hit by Blake Gailen and scored on a sacrifice fly from Locastro. Again, Frisco quickly responded with another run in the top of the third to tie the game at 2-2. A two-out double by Isiah Kiner-Falefa plated Michael O’Neill who had drawn a walk from Buehler. Matt Beaty Wednesday night a 12-3 victory over Frisco. From there, the scoring slowed until Latimore struck for the Drillers in the sixth. Beaty opened the sixth with a base hit, and Jose Fernandez was hit by a pitch. Latimore put the Drillers in front when he lined a pitch from Yohander Mendez into the Busch Terrace in left field. The three-run homer put Tulsa in front 5-2, and the lead would only grow in the later innings. In the seventh, Locastro reached when he was hit by a pitch for the team-record 22nd time this season. Three straight singles from Erick Mejia, Beaty and Jacob Scavuzzo produced three more runs. A two-out double by Latimore scored Scavuzzo to increase the Drillers lead to 9-2. 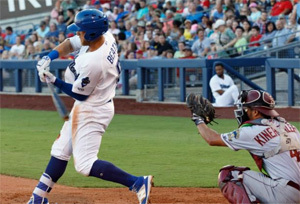 Three more runs in the eighth would cap Tulsa’s big offensive night. Scavuzzo delivered a two-run single, and Fernandez finished the onslaught with a run-scoring single. The big offensive night continued a trend for the Drillers who totaled 14 hits for the second straight night. It is the sixth time in seven games that they generated at least 10 hits. Beaty led the way with three hits, while Latimore and Scavuzzo added two hits each while also driving in four runs apiece. Locastro also had a pair of hits while scoring three runs. Reliever Karch Kowalczyk worked a scoreless sixth inning to pick up the win and even his record at 4-4. Buehler made the start and worked 4.1 innings. He surrendered two runs on four hits and two walks while striking out five. Yaisel Sierra pitched the final three innings for Tulsa to collect his fourth save. 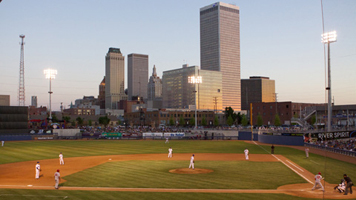 The Drillers will continue their homestand Thursday night with the second of three games against the RoughRiders. Chris Rearick (0-1, 6.00 ERA) will make his fourth start for Tulsa, while Frisco will counter with Ariel Jurado (7-5, 4.08 ERA). First pitch at ONEOK Field is scheduled for 7:05 p.m. This entry was posted in Sports on July 6, 2017 by admin.